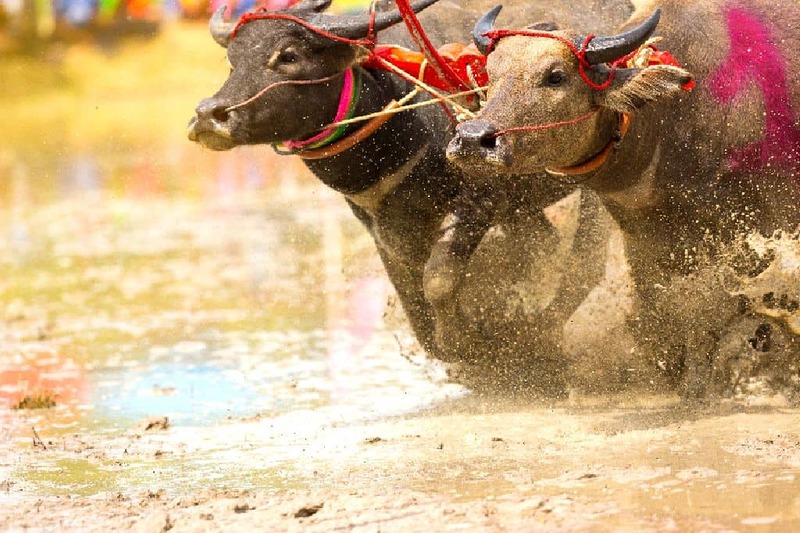 Join this year in the celebration of Chonburi’s annual Buffalo Racing Festival. Races, pageants, and more rejoice the contributions of these gentle beasts. The water buffalo has been and still is an integral part of Thai agricultural life. Throughout the year, farmers all over Thailand rely on these animals in every aspect of their lives. Just one hour north of Pattaya, Chonburi has been celebrating the end of Ok Phansa, or Buddhist Lent, for over 100 years. This buffalo festival celebration features races, as well as pageants. These shows feature decorated buffalos pulling ornate floats. Even though farmers are using more advanced technologies, they still appreciate their working companions. The festival is a good chance to show appreciation. It is also an excellent opportunity for these hard workers to get out for some exercise. In addition to the races, there will so be pageants for people and buffalo alike. Come find out the winners of the Healthiest animal, the Fashion Show, and the beauty competition. There will be events every day including, music, parades, food, and lots of fun. Travel to the festival is not difficult. Roads in Thailand are excellent and connect all the major cities. You can travel either by bus, minivan or taxi from Bangkok or surrounding towns. Buses to Chonburi depart from Ekamai bus station. You can reach the Ekamai bus station with the BTS/Skytrain. The bus station is on street level and next to the BTS. Thailand celebrates lots of different festivals throughout the year. Read more about other festivals in Thailand.